English artist and Royal Academician who was one of the foremost British painters of landscapes and peasant life. ALS. 1p. 61 Carlton Hill, N.W.8. June 11th, 1937. To Victor Hume Moody. 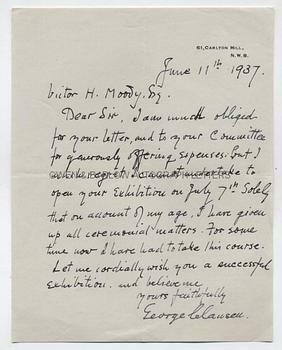 "I am much obliged for your letter and to your Committee for generously offering expenses; but I much regret I cannot undertake to open your Exhibition on July 7th. Solely that on account of my age, I have given up all ceremonial matters. For some time now I have had to take this course. Let me cordially wish you a successful Exhibition." Large 8vo. Approx 9 x 7 inches. 3 inch scissor cut to left edge (probably caused when opening the envelope in which the letter was originally contained), else fine. From the archive of Malvern artists, Victor Hume Moody and his daughter, Catherine. V.H. Moody was principal of Malvern School of Art (1935-1962) in which post he was succeeded by his daughter. He has been called "the last classicist painter" and both he and his daughter were opposed to the onset of modernism in art. He organized many exhibitions, both at the School and in conjunction with the Malvern Festival and it is in this connection that Sir George Clausen is writing.